The penultimate issue of 'No.1 With A Bullet' is one of its best. As the miniseries draws to a close so does the noose around the neck of the mysterious killer/stalker. Nothing it turns out is as it seems and you'll be questioning everything. After Grover is attacked and Jad flies off a cliff, suspicion and evidence begin to implicate Violet. It shakes Nash up as she reevaluates her relationship with her and it's beautifully and painfully relived in flashbacks. Jorge Corona and Jen Hickman continue to perform an elegant and balanced dance of art between past, present, and the bizarre with great designs and vibrant colors. As timely and as unflinching as the portrayal of toxic internet abuse, exploitation, and shaming has been 'No. 1 With A Bullet' uses science fiction and technology in a similar fashion that Black Mirror does to be the conduit to our worst fears. In this case, when hi-tech contact lenses capture an intimate moment between Nash and Jad it's leaked and turns her life upside down. It's something all too relatable this day and age with our current level of technology. NOWAB heightens these fears and dangers to a whole different level leaving Nash a shell of her former self. It's also the technology that becomes the weapon of choice for her stalker. Although the violence may be the old-fashioned kind, hands-on, the atmosphere of shame and bullying is incubated by the internet. Nash has been through an emotional roller coaster through five issues. This penultimate chapter is not only the breaking point it's the point that parts of the mystery get exposed. Without revealing it here, the revelation, in the end, is a jaw-dropper. It will have you going back to issues 1-4 going over the clues we all missed. Just as Nash has to reevaluate her life, we as readers have to review what we missed up to this point. Of course, the answers were right in front of us all along. Corona and Hickman have created a unique sometimes surreal world full of psychedelic visuals. Corona's style lends itself to suspense and part of the impact of the story is told through his pencils. 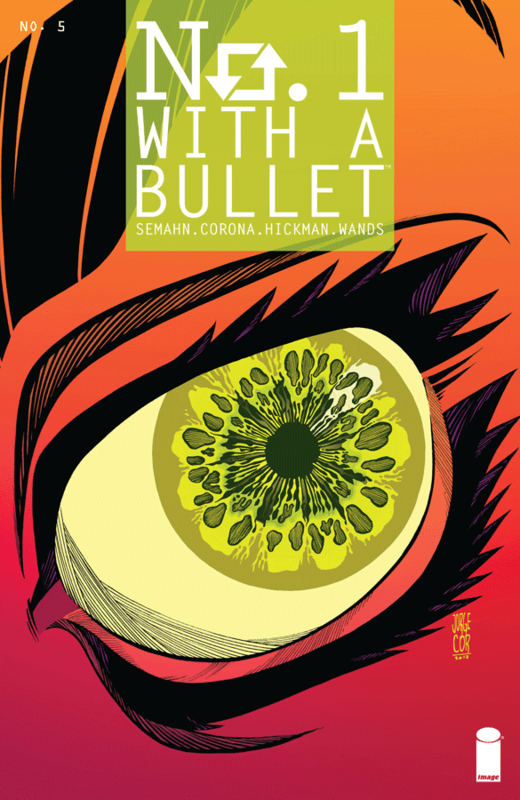 Hickman's colors are so bold and rich that they are the knockout punch to Corona's designs. 'No. 1 With A Bullet' reaches its Hitchcockian twist and blows the doors open on this suspenseful tech thriller. Once again, Semahn balances an emotional arc with the cold-blooded precision of a mad doctor opening up a patient like a pinata. Kudos to Semahn, Corona, and Hickman for still being able to surprise readers and attack every one of our emotions.